Last Christmas I was strolling on Instagram and came across a post by a mom. She had created a ‘choose your own adventure’ book for her kids to do just that, choose what they wanted to do as an adventure. This free ticket to family escapades was in place of a tree skirt full of boxes and bows. As we have worked hard to purge our home of the things that are of no value to our home or lifestyle I’ve had many heart to hearts with myself. How did all this stuff get here in the first place? Why is there just SO much? Do we really need all of this!? This also goes for the gifts we give. Instead of new hotwheels for Levi’s 4th birthday, we had a local ice cream date. Then made a big outing to the city for the play place, cake and pizza with some friends and family there. Rather than another princess craft set for my niece, my sister and I had a special date of bowling with her daughter and Levi. I’m sure Conor would have loved a new gunscope (is that a word?) for his 30th birthday. Instead, I made him this book of all the favourite memories I collected from our family and friends. He reads it often and loves it. He’s used to seeing ‘words’ from me….Kinda like the personalized crossword puzzle I made him for Valentine’s day. Lenayah had already caught on and when her bday rolled around this summer requested a family beach day and ice cream. So we loaded up and headed south to meet up with my family for just that. Shortly after my bestie threw a surprise birthday for me this August, I took her on super fun lady date for her birthday. I wasn’t sure how this would all work out, or how the kids would respond to it. After all, we do love spoiling our kids with certain things we know they will love. We also do love giving and receiving thoughtful and useful gifts. A lot can be said by putting intention and attention into selecting something special for a friend. However, in the process of thinking of things to ‘do’ rather than ‘buy’, we realized there are those ‘bucket list’ things we didn’t even know existed – until we made the point of selecting unique experiences we wanted to give to the people we love. 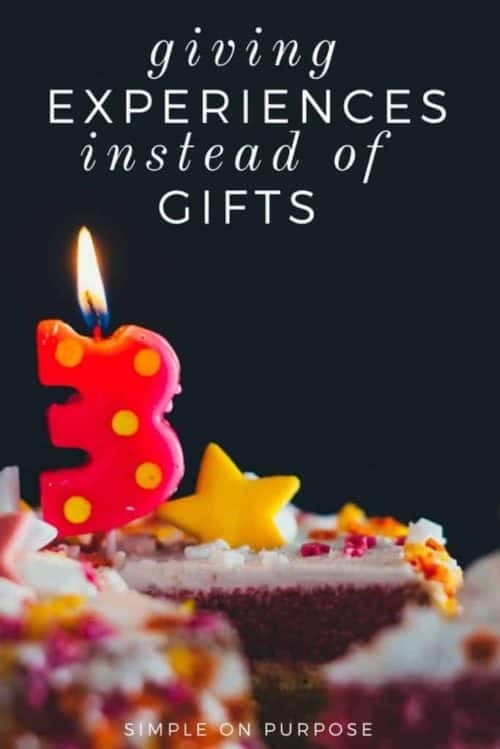 It isn’t necessarily cheaper than buying presents but sharing an experience with someone, making a memory alongside them, trying to translate their passions into actions rather than things has made us look at celebrating others in a whole different light. Sometimes the totally punny sentiment ‘presence not presents‘ will always win out….unless someone wants to buy me a food processor, in which case I will have you over to experience the best beet hummus with me! What kinds of ‘experiences’ have you given in place of gifts?